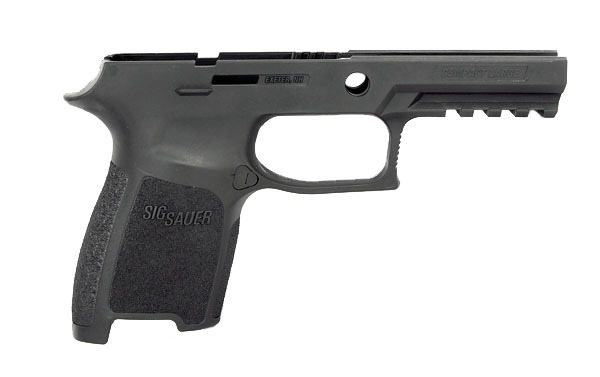 Factory Sig Sauer P250 Grip Module allows the shooter to tailor the pistol to meet their specific grip size requirements. Black polymer construction and comes with the magazine catch installed. This is the large grip for the .45ACP P250 Compact. I purchased this grip module to make my Sub-Compact P250 .45 usable. The only grip available with the Sub-Compact P250 .45 is Small. This makes it very, very difficult to fire the DOA trigger reliably. I modified this Compact/Large grip module to fit my Sub-Compact slide by shortening it slightly. The added bonus is the 9 round Compact magazine capacity versus 6 rounds for the Sub-Compact. This module solved all my problems with my P250 which is the safest and most concealable option for IWB concealed carry. Nice product and fit my needs perfectly.